As you can see the content is designed to fit with a mobile device. 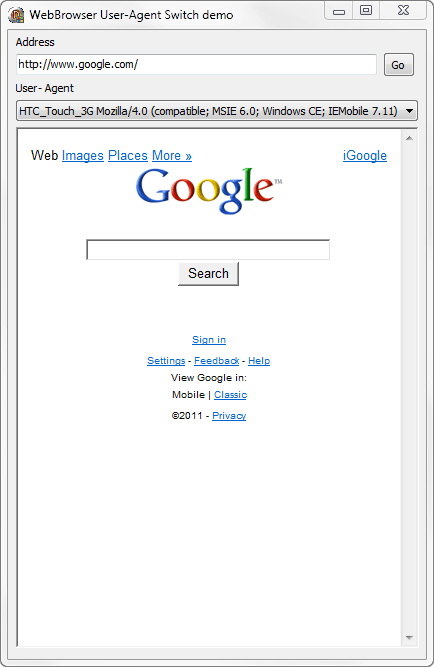 in this post I will show how you can change the user agent of a TWebBrowser component. to change the UA of TWebBrowser you must call the OnAmbientPropertyChange event of the IOleControl interface with the DISPID_AMBIENT_USERAGENT flag and in the implementation of the Invoke function for the IDispatch interface set the value for the New User Agent String. check the next source code using a interposer class of the TWebBrowser which declare a new property called UserAgent in the component. //the current interface supports IOleControl? Now to use the above code your only need to add a TWebBrowser component to your form, then add the declaration of the New TWebBrowser class to begin of your unit and finally you must add the implementation of the methods show in this article. Now to set the new user agent, you only must set the UserAgent property. 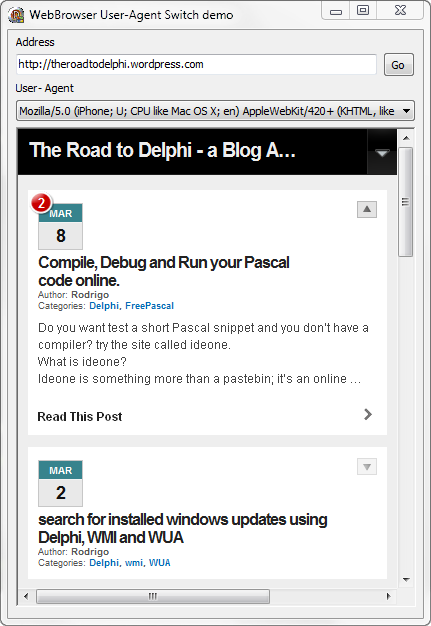 Categories: Delphi, TWebBrowser | Tags: Delphi, TWebBrowser | Permalink. hey. Great app works perfectly. But I have a problem. I want the twebbrowser’s user agent to change once it’s created. I implemented your code in an app I’m making, but the user agent changes after the 2nd navigation and refresh! help please? BTW great site and great articles! 1) calling the Navigate method with about:blank and then call again the page where which to go. dude, it works perfectly! but a question. What does WebBrowser1.handleNeeded do? Cause i didnt put it and it still works! Ok got it now. Thank you a lot! This is a great article but I have a problem with the code. Using Delphi 2009 when I recompile the project (with no changes) it doesn’t work. Any guess why this happens? No nothing, not even warnings upon compilation. Application starts but I get “Navigation to the webpage was canceled”. 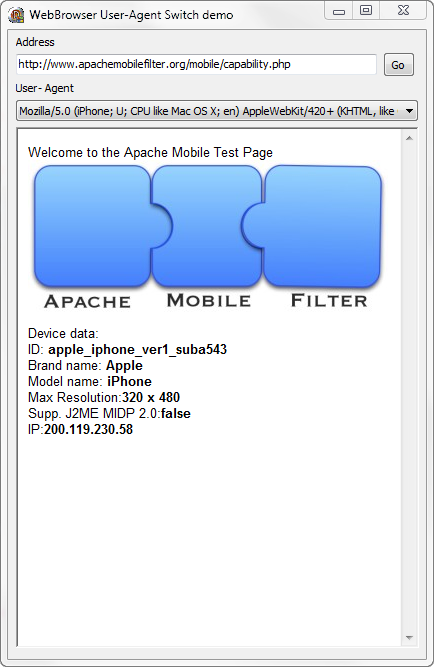 I just test the sample application in Delphi XE (I don’t have delphi 2009) and works fine, so sorry but for the moment I don’t know what can cause this issue. I will look it and if I find something I will post back. Interposer class of the TWebBrowser ? WTF? Where do I put this code? Can you make the example downloadable? Hi Rodrigo, should this work in Delphi7 too? Yes, this code should work in Delphi 7 without problems. maybe it’s not really the case? maybe you can judge by yourself ? I’m trying to create a desktop client and I’d like to add a proxy configuration option. So it could work with a diferent proxy than the system one. I can’t find the solution. Tried to investigate your way to set UA but I don’t find here the answer. Hi Javier, I don’t see the relation between set the User Agent and a proxy. So I’m guessing, are you trying to setup a new or existing proxy to use in a TWebBrowser control? I thought that maybe it could be set host, port and type of a proxy server to a TWebBrowser using the same method described in this post for setting up the user agent. It is not possible but, could you help me by mail or with an other post in your blog that explains how to add this capability to a Delphi application? Setting up a proxy server in a Delphi application/component. Isn’t it better to change via SetInternetOption / UrlMkSetSessionOption ?? Depends what you need, The UrlMkSetSessionOption and InternetSetOption methods can be used to set the UA but for the current internet session and for all the sessions, this article shows how set the user agent in each instance of the webbrowser. I’ve tested this code on Windows 8.1 and Internet Explorer 11. If I go to http://www.whatsmyuseragent.com/ the fake User Agent is showned. the real user agent is displayed. I didn’t know before, why some flash players reported the real UA even if I used a fake one. 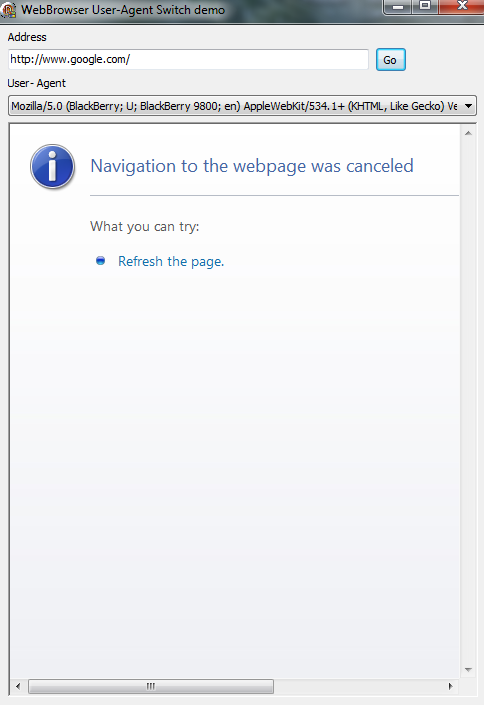 Do you know if this is happening only with IE 11 ? or we can fix it somehow. some solution to see this web in Twebbrowser? Maybe the user agent string is not recognized by the site, You can try with another user agent string. remember the UA listed in the demo App are just samples, you can use any valid UA. Great! Embarcadero never thought to include this patch in the official component? Rodrigo, thank you a lot. That is working very good, you helped me a lot!! !